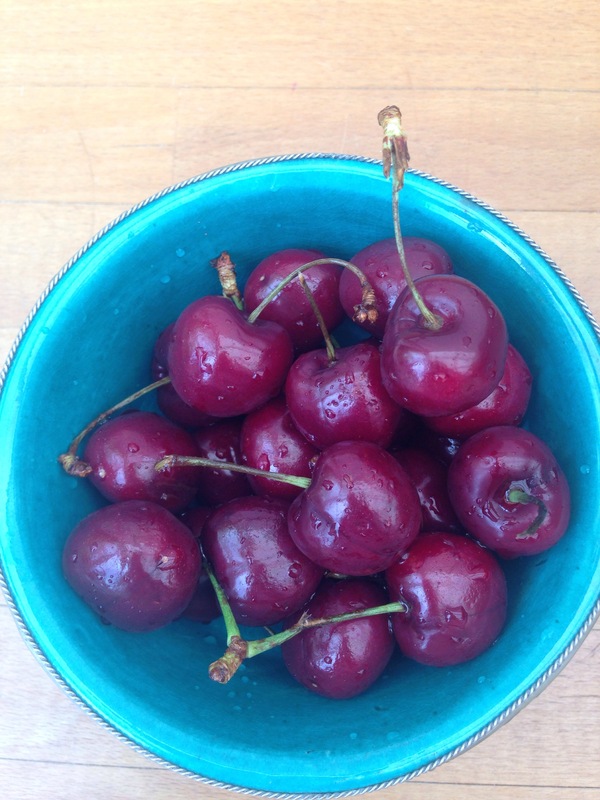 Included in my fabulous Abel&Cole fruit and veg box this week was a punnet of cherries. I devoured the entire punnet in minutes. One is just never enough. Knowing that Abel&Cole’s motto is to only include seasonal produce in their weekly boxes, it dawned on me that the cherry season must finally be upon us. Happy days! The humble cherry comes highly charged and is a bit of a dark horse. It is packed with anti-oxidants, a potent detoxifier, an anti-inflammatory and immune system booster. So far so impressive. But what I didn’t know is that cherries are also rich in the mineral Boron which can help prevent the steady loss of bone density with advancing age, this according to the excellent and invaluable book Natural Wonderfoods; 100 Amazing foods for Healing, Immune Boosting, Fitness Enhancing, Anti Ageing. And, as if that was not enough, you can even make an infusion of cherry stalks, which can be helpful when dealing with cystitis and bladder problems in a natural way. So there! Shopping for local and seasonal food is nothing new, but it hadn’t dawned on me just how important it could be until I read Clean, Dr Alejandro Junger’s amazing book about gut health and detoxing. In it, he goes as far as saying that produce that is local, can sometimes be a better buy than organic produce coming from afar. Your local farmer may struggle with the stringent organic certification process, despite using no pesticides in his farming. As a consequence, he may be bypassed by consumers opting for organic produce flown in from abroad. Still, the fact remains, a head of Kale that has just been taken from the ground at a local farm and driven to a local farmers market is always going to have more nutrition than the head of Kale that has grown organically but then been transported for thousands of toxic air miles. Makes you think!